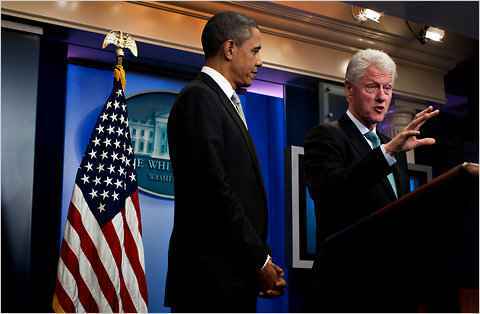 Former President Bill Clinton held a remarkable, spur-of-the-moment news conference at a White House podium on Friday to announce his backing for the tax compromise President Obama reached with Republicans this week. Mr. Clinton and Mr. Obama turned up in the White House briefing room after meeting privately together in the Oval Office. Mr. Obama introduced the 42nd president and then stood by as the one-time occupant of the White House offered his thoughts. The president stood by Mr. Clinton’s side for several minutes as Mr. Clinton held court in front of the White House logo that often hovered behind him a decade ago. But after Mr. Clinton began taking questions, the current president excused himself, saying that his wife, Michelle, expected Mr. Obama’s presence at one of the many holiday parties that presidents host during the month of December. “I’ve been keeping the first lady waiting,” Mr. Obama said, excusing himself. And with that, Mr. Obama departed, leaving Mr. Clinton to continue his extended conversation with the media. The image on the television screen – of Mr. Clinton at the White House, behind the official podium – had a time-warp quality to it.